Summary: Ed Wilson, Microsoft Scripting Guy, talks about adding a description to variables. Microsoft Scripting Guy, Ed Wilson, is here. There is a “water feature” outside that keeps running and running and running. It is a bit strange, and to be honest, it makes me think that it is raining all the time. In central Florida in the summer, it is generally a safe bet that it will rain, but even when the sun is outside, without a cloud in the sky, the giant frog keeps spitting water into a pond. I don’t get it. It is not relaxing like a Zen pond, and it does not keep bugs at bay like a real frog would do. It just sits there. Sometimes I run across things on my computer that are bit like that ceramic frog, and I just don’t get it. I see a user account and wonder, “Why was that created?” Or I see a group that causes the same question. On the network, it is even worse, because there are multiple admins, and often a bit of turnover, so no one knows why something was created. Unfortunately, the old technique of “delete it and see who complains” does not work for today’s fast-paced environments. I mean, who in their right mind wants to create additional work for themselves. And unfortunately, “see who complains” might not complain for several months—in which time you forget what you deleted in the first place. So it means hours of troubleshooting (because if I really knew the app in the first place, I would know what the "thing" I was getting ready to delete would do). Luckily, with Windows PowerShell, I can fix some of that. In my profile last week, I added two variables that I want to always be available to me. These are global variables (meaning I can use them in functions, modules, and the like), and I really don’t want them changed. In fact, the reason I created them was so that I would have a consistent environment. But unfortunately, when I created them, I did not ensure any of that. To make matters worse, I did not even document why I was creating the variables in the first place. PS C:\> Set-Variable a -Description "my variable"
Note When using Get-Variable or Set-Variable, I do not use the dollar sign ( $ ) in my variable name. That is all there is to using a variable description. 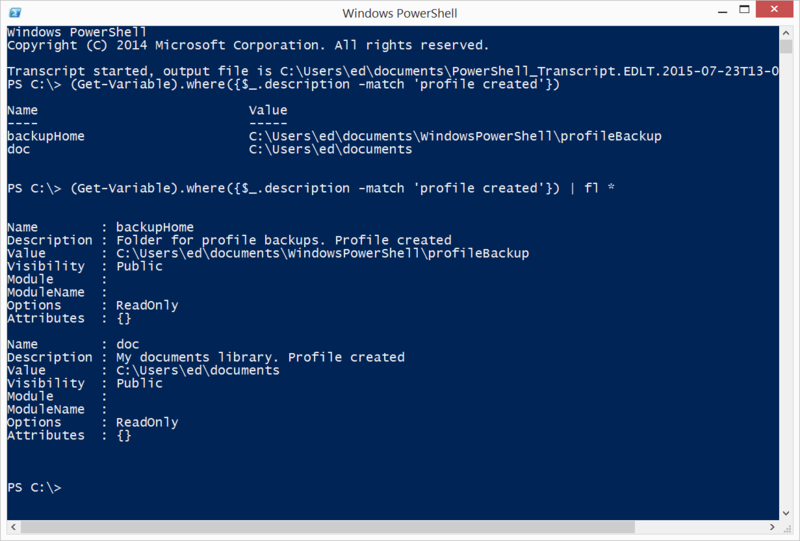 Join me tomorrow when I will talk more about Windows PowerShell profiles.